GRAND RAPIDS, Mich – The Presidents of the Grand Rapids Police Officers Association and the Grand Rapids Police Command Officer Association have issued a joint statement following an incident on March 24, where a group of five black males ranging from 12 to 14-years-old were held at gunpoint by police officers. Officials say the boys were stopped while walking home after playing basketball at the Kroc Center. The boys reportedly matched a suspect description of someone seen possibly carrying a gun following a fight. The boys were ordered to get on the ground and were detained, but ultimately it was found they were not armed. The boys were later released to their parents with a full explanation of what happened. On Tuesday during a city commission meeting, Police Chief David Rahinksy (above) issued an apology but said ultimately, protocol was followed. Several residents, including parents of the boys, also spoke out at the meeting, calling for changes to police policies. “This has affected my boys tremendously, where they can’t even play basketball comfortable outside of their own home. I’m calm, but I’m very angry,” said one of the boys’ fathers. 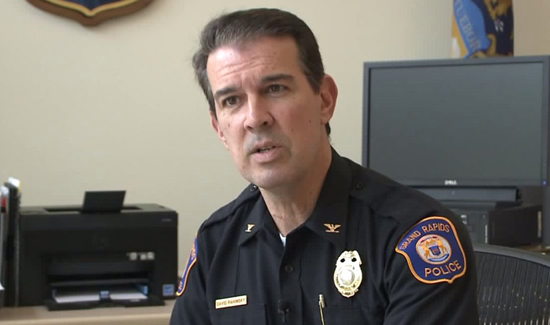 On Wednesday, the two unions said there is no need for any policy changes within the Grand Rapids Police Department at this time.